A few years back, I swung by a staple in the Austin strength-training community to rendezvous with trainer Candace Smith of Beauty of Strength, who is among the best of the best at getting workouts in anywhere, anytime, with anything (including nothing). She makes her way around as a full-time RVer, so trust me, she knows how to make anything work! I’m so pleased to deliver you this free and fiery workout (hellooooo, sumo rows!) with an upper-body focus from her today. All ya need is two bells and twenty minutes. 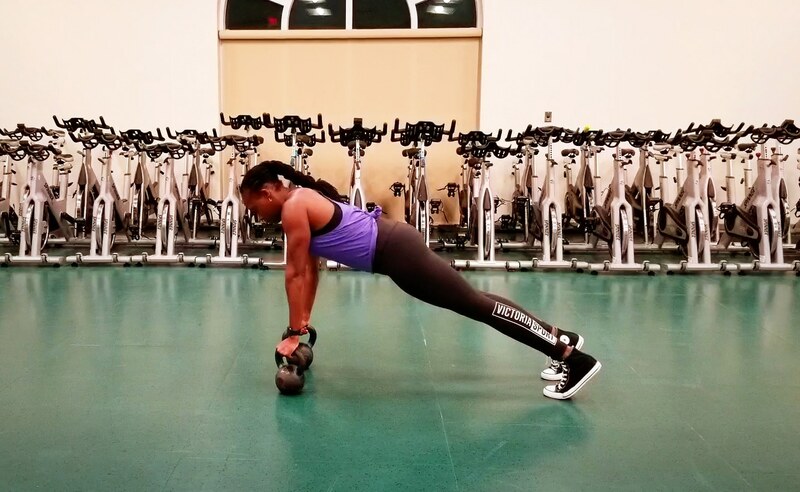 Kettlebells are fun and versatile, allowing you to get in a great workout with just a couple pieces of equipment, and they’re travel friendly, so you can work out on the go. The ways you can move them can provide a perfect combination of strength and conditioning, all in one piece of equipment. Here are four kettlebell exercises I love. Each builds strength and hit all of the upper-body muscles with just a few movements. This workout is short and sweet, but oh-so-effective. Set an interval timer for 20 minutes, and complete as many rounds as possible before the buzzer goes off. To maintain solid form (priority No. 1! ), rest as needed and then get going again! Candace Smith is an online personal trainer with a passion for helping women break the diet cycle and become the best versions of themselves through heavy lifting and practicing self love and compassion.